Although it was a matter of debate whether oral or written messages were more secure, these sorts of anxieties seem especially to be provoked by any sort of information technology, such as writing. Security is a measure of control, and turning anything into information – writing it down, for example – means loss of control to some degree. 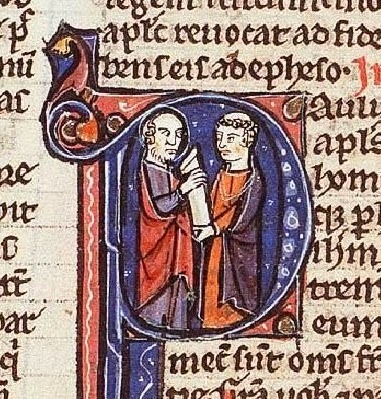 In the 9th century, Abbot Einhard wrote that ‘it is better to trust a loyal man than a written document, since if a document or piece of parchment falls [out of the hands] of its bearer, every secret it holds is revealed, but a loyal messenger, [even if] tormented, does not betray the message entrusted to him’. All information is hackable; one can never be completely certain that someone other than one’s intended audience will read any message. Systems of authentication (seals, tokens of credence, etc.) were common throughout the Middle Ages, and encryption was sometimes employed. Indeed, it is probably a safe bet that any information technology will produce techniques and tools to control information. Perhaps the greatest difference in information security between us and the Middle Ages is that, unlike modern people who post embarrassing information about themselves on Facebook and are surprised when it is plastered all over the Web, literate people in the Middle Ages seem to have had a greater awareness that anything written is (always potentially, often actually) public. The image of the historiated initial shows St Paul presenting his epistle to the Galatians, from a 13th-century Parisian Bible: The Hague, Koninklijke Bibliotheek MS 132.F.21, fol. 555r. For the substituted letter as a narrative device, see Stith Thompson, Motif-Index of Folk Literature, 6 vols. (Bloomington: Indiana UP, 1955-58), motifs A1335.1 (Origin of death from falsified message), K511 (Uriah letter changed), and K2117 (Calumniated wife: substituted letter [falsified message]). The standard scholarly edition of Emaré is Edith Rickert, ed., The Romance of Emare, EETS ES 99 (London: Kegan Paul, Trench, Trübner, 1908; rpt. 1958). But a student edition edited by Anne Laskaya and Eve Salisbury is also available online through TEAMS. The quotation from Einhard is from Paul Edward Dutton, ed. and trans., Charlemagne’s Courtier: The Complete Einhard (Peterborough: Broadview P, 1998) 158 (Hampe 61). It also appears in Pierre Chaplais, English Diplomatic Practice in the Middle Ages (London: Hambledon, 2003) 10, where the Latin is also provided: ‘Potius enim fideli homini, quam karte credendum iudico, nam charta sive membrana, si se ferenti elabitur, omne quod continet secret[um patefacit], at nuntius fidelis nec tortius sibi commissum prodit.’ Chaplais’ book contains a great deal of very useful historical information about this subject.